Sometimes you don’t feel like treating Chiang Mai like a non-stop food safari. Sometimes, the usual parade of big names — Huen Phen, Lamduan Faham, Samerjai, OMG! 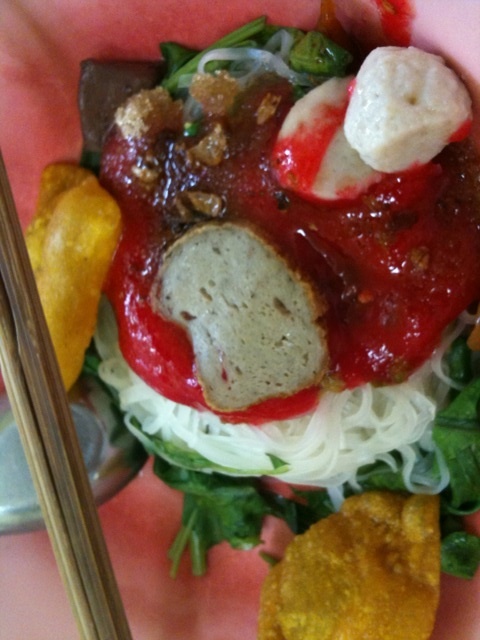 — makes you feel all weary inside after thinking of the inevitable throng of people in line for a bowl of khao soy. And sometimes, you just want to eat where all the other jaded Chiang Mai-ers eat. Because sometimes, Chiang Mai people are sick to death of aharn nuea (Northern Thai food), just like how Hua Hin people get sick of crab (unbelievable, I know, but it happens). And when that happens, they go to places like Yen Ta Fo Sri Ping on Suthep Road, where the chipped plastic bowls feature al dente thick, thin or glass vermicelli noodles liberally swimming with a garishly pink, chili-flecked seafood sauce crowned with a single, perfect fried wonton (35-40 baht). There is also the requisite tom yum noodle (30-40 baht) and egg noodles with red pork and dumplings (40-50 baht), but nothing is as deliciously saucy as the namesake yen ta fo, a dish sure to get on your shirt and all over your face. And yes, I did rub my eyes after eating, and yes, severely regretted it for hours afterward. I would argue that the namesake dish at Guay Jab Nam Khon Sam Kaset, right by the city’s monument to the three kings, is not the best dish here, although it is light and peppery and includes plenty of luk lok, a sort of soft porky sausage (50 baht). The gow low (broth without noodles) centers on a richer broth that tastes of beef and plenty of coriander (50 baht), and the khao moo krob is as good as anything you would find in Yaowaraj: a mix of crackle and fat, a thick sweet sauce enveloping the rice grains (50 baht). What can I say? I really like sauce. But if it’s something light and fresh you desire — Thailand via Hanoi rather than Hong Kong — there is always Raan Fer Wiengjan on Rachadamnoen Road. You have your choice of chicken (30-40 baht), fish (40-50 baht), tofu (30 baht), and the Northern delicacy moo yaw (30-40 baht), a pork “pate” originally created by Chinese-Thai chefs seeking to replicate French meat terrines. 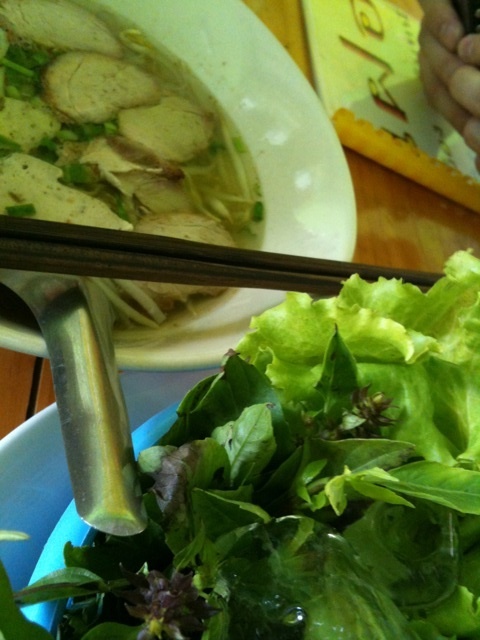 Vegetarians, don’t despair: Chiang Mai is thinking of you too. 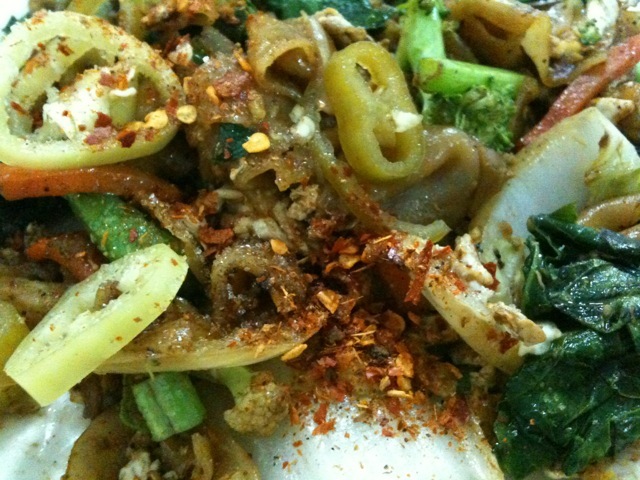 Or, specifically, Raan Jay Yai on Nimmanhaemin Road is. Anything on the regular menu can be made “jay” (a stricter Thai form of vegetarianism), including great versions of khao kluk kapi (rice fried with “shrimp paste”, 35 baht), guaythiew kua “gai” (noodles fried with a chicken substitute, 30 baht) and pad see ew (stir-fried noodles in soy sauce, 30 baht). 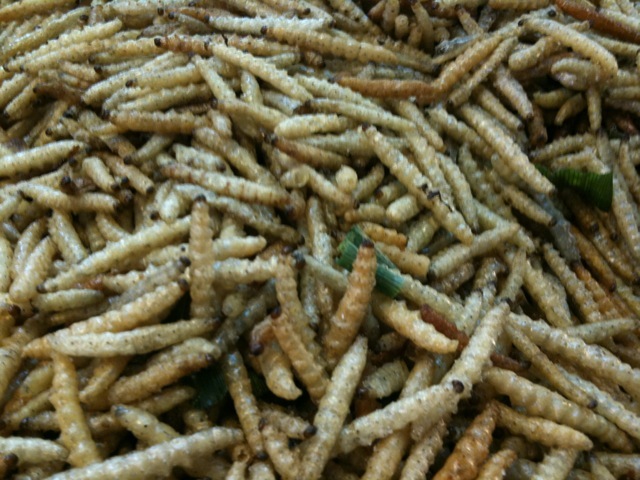 This is all well and good, but did you really think I went to Chiang Mai without having ANY Northern food at all? What am I, an idiot? (Don’t answer that). Of course I went, and filled my face with nam prik ong and thum kanoon and sai oua and shrieked and gurgled as every Northern dish passed me by on the way to someone else, and wished myself stuffed full of everything that was good in the world. So that is how I found Haan Tung Jieng Mai (Northern dialect for Raan Tung Chiang Mai) on Suthep Road by the Chiang Mai University campus. It’s a typical aharn tham sung (made-to-order) stall, but made achingly cool by the scraps of paper doodled by bored university students coating the tables and the kitsch-retro furnishings. That said, the food is solid, if slow, including rice fried with young green chili dip, pounded young jackfruit, and a nam prik ong that tasted suspiciously like shrimp paste (in the landlocked North, most recipes call for tua now — fermented beans, or nam pu — the juice of pulverized rice paddy crabs, instead of kapi). Plus, there was a perfectly cooked kai ped yang matoom, a duck egg boiled just enough so that the yolk is “sticky”, like rubber sap. No, our trip wasn’t all about food. I DO have other interests, you know. For instance, the PURCHASING of food. That is where the Saturday morning organic market off of Nimmanhaemin Road comes in. Organic producers of vegetables, fruit, rice and ready-made foods meet once a week to sell their bounty to the general public, and it’s a shame something comparable isn’t happening in much-bigger Bangkok. Food for thought, maybe, for an organized and responsible food lover? (Not me). Maybe, just maybe, we can bring in something from Chiang Mai that doesn’t involve hastily-taped cardboard boxes and a few anxious moments by the baggage claim carousel. Fantastic round-up! 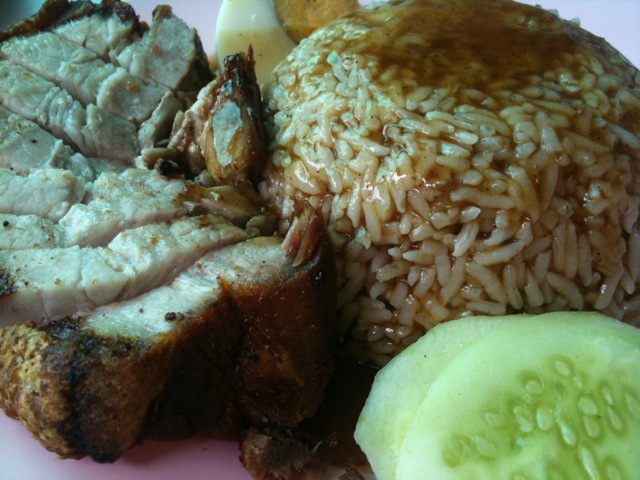 I’m craving a few (or all) of those descriptive dishes right now – particularly the khao kluk kaphi. Thanks, Mark! 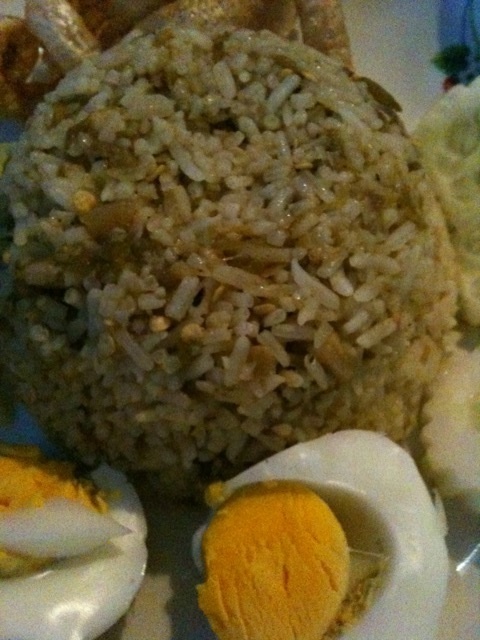 I like khao kluk kapi too, but for some reason I don’t eat it very often! Endless food tour there! 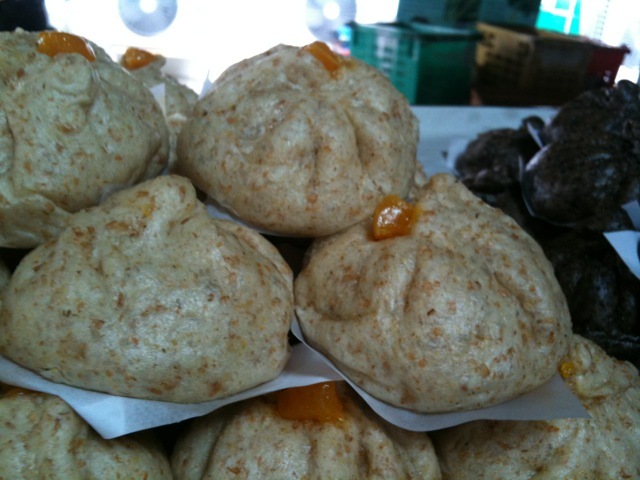 That wholewheat salabao looks really good btw. Wonderful stuff, makes my mouth water! Thanks! Hope you enjoy these places as much as I do.